We interviewed John Farley, our son-in-law, in July 2013, but haven’t been able to put the interview online until now. We have enough material to break it into two parts. We will post Part 2 next week, so be on the look-out. The reason for our delay is that so much has been going on for us during the last few months – action on some film and TV scripts…and we moved in August. We only moved half a mile away, but it’s still a lot of work. We all know how much work it is, so no need for details. John is an actor-comedian who started his career with Second City in Chicago and has tons of film, television and live performance credits. John is also Chris Farley’s youngest brother. 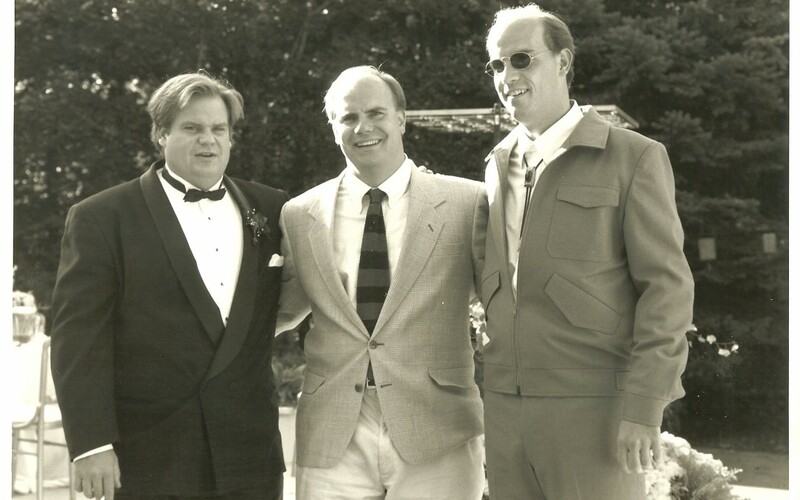 Needless to say, when we asked John about his misadventures in the entertainment business, he naturally told stories that included Chris Farley and one of his other brothers, Kevin Farley, who is also in the entertainment business. Bruner & Stevens: Do you have any stories you can share with us – any interesting stories of misadventures in the entertainment business? Well, there were four cop cars in this massive stunt. Kevin was in the lead car as a passenger in the front seat. I was in the second car…driving. That was a mistake – I had never done stunt driving before. The lead driver thought he heard action and suddenly took off like a bullet. I took off right behind him. I gunned it so I could get a squeal out of the tires. The lead car driver finally realized that there was not an action call and he stopped suddenly. I didn’t have time to stop, so I barreled right into the back of him. I knocked the lead car’s bumper off. The driver wanted to kill me. He didn’t know that I was Kevin and Chris’ brother, so Kevin had to listen to him ranting on about it, furiously. Chris and the director saw the whole thing and were wondering what the heck happened. Chris is thinking, oh geesh, my brothers are messing around again. Then the director yelled action for real, and when my car made it up to the spot where we were to stop and jump out, my bumper was hanging off and the lights barely worked. They had to get me a new car and do the scene again. Bruner & Stevens: Did you get extra stunt pay for the stunt? John Farley: I don’t think so. We cost them more than what our parts were worth. They did it for Chris. Bruner & Stevens: Can you think of another one, another Misadventure? John Farley: There’s actually another story during the filming of BEVERLY HILLS NINJA. We had finished filming and went to where Chris was staying, The Park Hyatt on Avenue of the Stars. Chris caught a glimpse of Sean Connery in the lobby and thought it would be really cool to go up to him and say hello. Even though Chris was famous, he still loved to see other celebrities. Needless to say, Sean freaked! He quickly stood up and shut his briefcase. He then ran over to the concierge desk, but no one was there. So, Sean turned and glared at Chris until Chris felt so uncomfortable that he just left, figuring there was no way to fix the situation. Bruner & Stevens: So, celebrities can be fans of other celebrities…so interesting. John Farley: Oh…I just thought of another story. This is just a short one. It was when we were filming BLACK SHEEP. The director was Penelope Spheeris, who also directed WAYNE’S WORLD. Penelope yelled at us for overacting. Bruner & Stevens: Did you overact? John Farley: Oh yes! We were thrown right into the fire. We were used to entertaining on a stage. But it made Chris laugh really hard. He told us, “You shouldn’t do that.” So, we toned it down…quite a bit. We basically were just speaking our lines like we were having a conversation. We learned, on a 20 million dollar set, the difference between stage and film acting. Tune in next week. We will have Part 2 of our interview with John Farley, with more misadventures in the entertainment business.